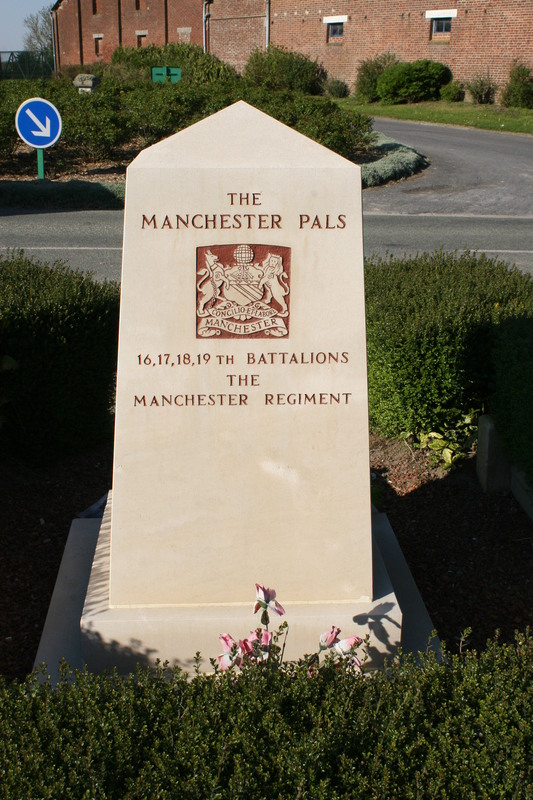 In the centre of Montauban there’s a small memorial which remembers the men of the Liverpool and Manchester Pals who captured the village on 1st July 1916. If you’ve read the previous post (and if not, why not? ), you’ll know that 30th Division held the extreme right of the British-held sector of the Somme, the French holding the line from their right flank all the way to the Swiss border. Another of the infamous Somme woods, Bernafay Wood, can be seen in the distance of this photograph. Attacking to the immediate right of the 8th East Surreys (again, last post), the men of 30th Division were tasked with the taking of Montauban village itself. Their initial objective, the Glatz redoubt to the south east of Montauban, was successfully taken not much more than an hour after the start of the attack, and by mid-morning they were in the outskirts of Montauban itself. They found the village utterly destroyed and, despite the attention of the German artillery, by early afternoon the whole of Montauban was in British hands. 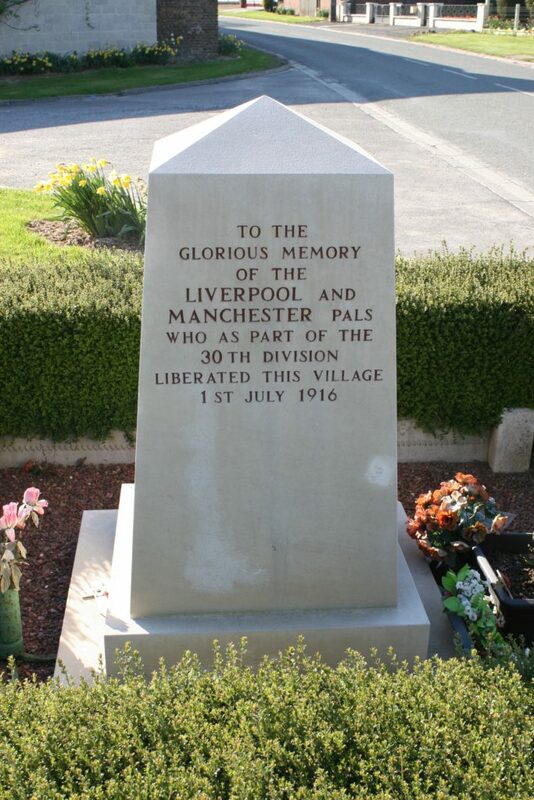 Seventy eight years later, on 1st July 1994, this memorial to the Liverpool and Manchester Pals was unveiled by Major General Peter Davies, Colonel, King’s Regiment, the same Major General Peter Davies who was responsible for forming and chairing the committee for the erection of the wonderful Animals in War Memorial which now stands in Mayfair in London, having originally seen an article in the Daily Telegraph proposing such a tribute. 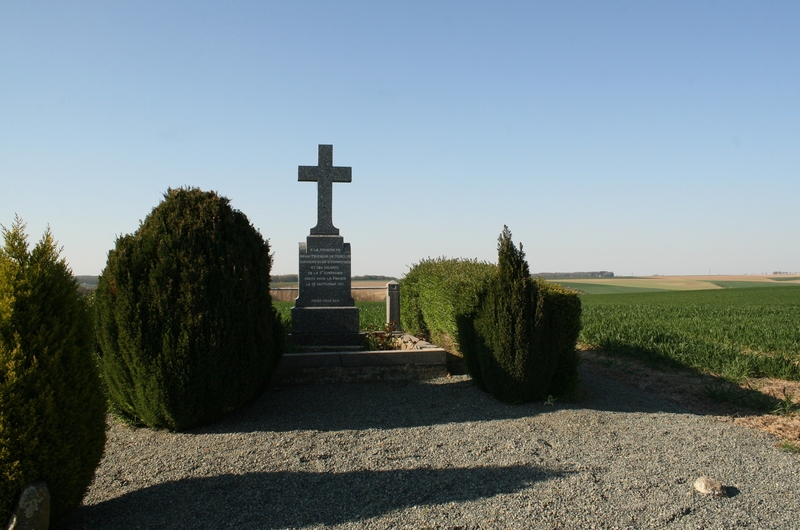 Just outside the village on the road to Mametz, a roadside memorial remembers Capitaine Henri Thierion de Monclin and the men of the 5th Company, 69th Infantry Regiment, Morts Pour La France, 28th September 1914. In the background of this shot (below) both Mametz Wood (left & centre), and the Bazentin Woods (right) can be seen, but our next stop, heading back through Montauban, is the British cemetery named after the other wood we saw earlier, Bernafay Wood. Before we do, however, a little background on some of the earlier fighting to take place around Montauban. 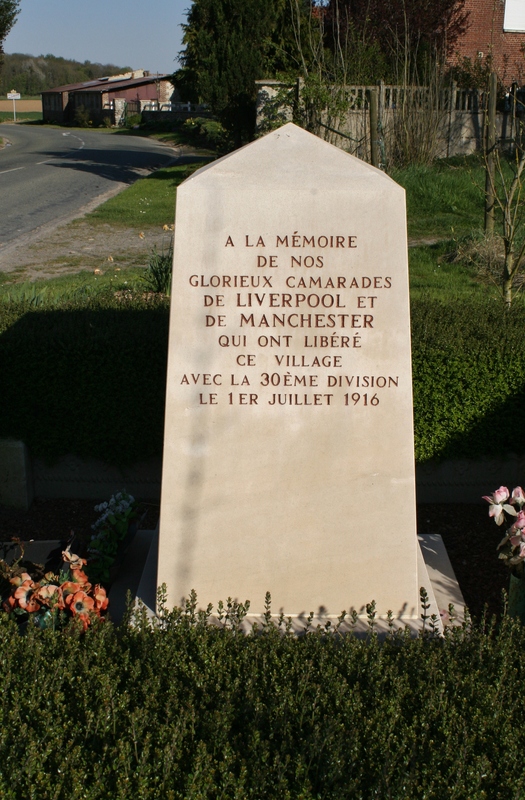 The Germans first passed through the village in late August 1914, as they continued their march across France before being halted at the Battle of the Marne in early September. Further south the Battle of the Aisne would be fought to a stalemate throughout the rest of the month, and to the north the Race to the Sea was already under way. 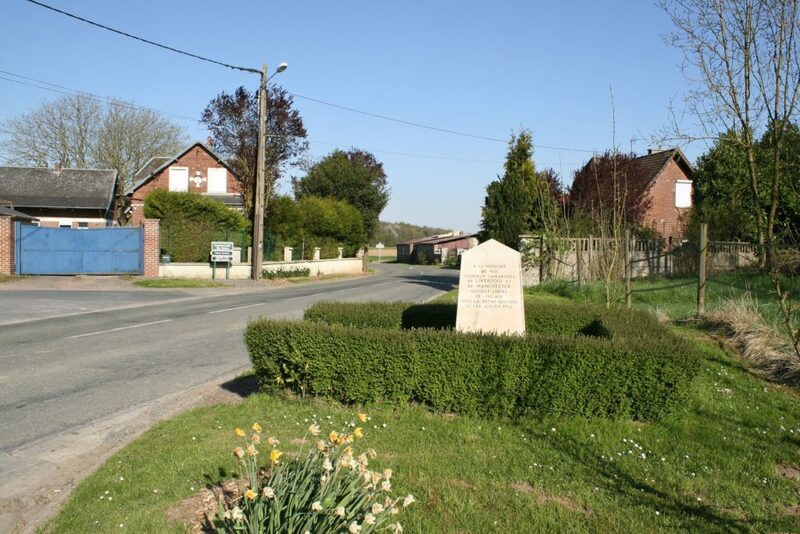 On the Somme, the Germans began to fortify the high ground, including the village of Montauban, the end result of which, twenty one months later, would become the tragedy of 1st July 1916. On 27th September the French, in the form of the 69th Infantry Regiment, realising that it was now or never to eject the Germans from their increasingly dominant position, moved to recapture the village. The Bavarian defenders found themselves under a hurricane of artillery and small arms fire and fled east out of Montauban, allowing the French to capture the village; by nightfall, barely entrenched on the western outskirts of the village, they awaited the inevitable German counter-attack, which duly came from the direction of Mametz Wood. Although the French initially resisted the attack, their flanks, on both sides of the village, were still up in the air, and on the following morning a hurricane of artillery fire, followed by a mass infantry attack, swept the beleaguered 69th Infantry Regiment from the village, and it was during these desperate moments that Capitaine de Monclin was killed. Despite attempts to recapture it, this time the Germans were not to be moved, and the French were forced to withdraw. Montauban would remain in German hands until the early afternoon of 1st July 1916. The memorial stands on the site of Montauban’s windmill, once the highest point in the village (the land has long since been flattened), and thus crucial to its defence. Monclin, already wounded in the early days of the war, but now returned to duty, had received no orders to withdraw from the windmill site despite both his flanks being in enemy hands. He told his troops that they would stay there until they died, and that is what these brave men did. 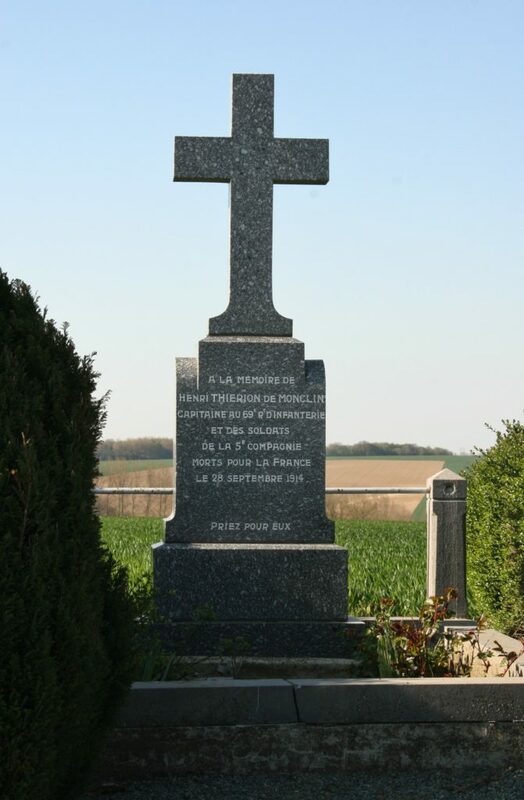 As a footnote, it seems that it is possible that Monclin may actually be buried under the cross. According to Graham Maddocks’ book on Montauban, the French equivalent of the CWGC has no details whatsoever for him, and on the IGN map of the area the site is marked with the word ‘Tombe’, as opposed to the more usual ‘Monument’ or ‘Mémorial’. 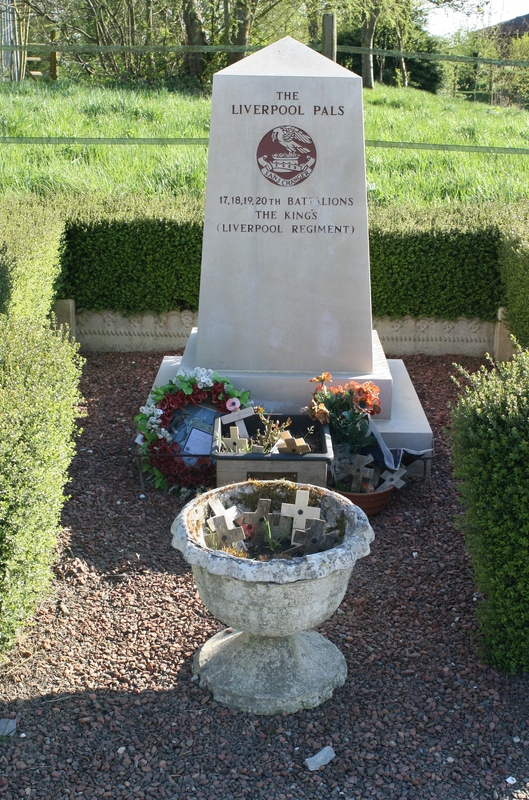 The article (in French) states that it is his grave (tombe) and that he died at Carnoy (just North-East of Montauban). It also says “wounded, he refused to let himself treated and was killed, together with most of his company, while covering the retreat of a nearby battalion”. The author also writes that this is one of the few signs of the French presence in the region of Albert, before the British took over this sector. Hi Chris. Did you see the photo of Monclin on the Picardie 14-18 site? Anyway, your comments intrigued me so I have searched my library (nothing better than a good book) this morning and, sure enough, I have found out a bit more about him. I shall add some text to this post, maybe later today if I get the chance. Carnoy, btw, is very definitely a couple of miles south west of Montauban. I just don’t know where I got this North-East direction, it’s definitely South-West as you write. I guess my map reading skills are back to 2nd Lt level since I retired……..
Have updated the post. Interesting, I hope.